At the request of a favorite blog reader, here's a closer look at those stamps. If you have a Flickr account, you can view large. But that's not all, folks - we've only just begun! 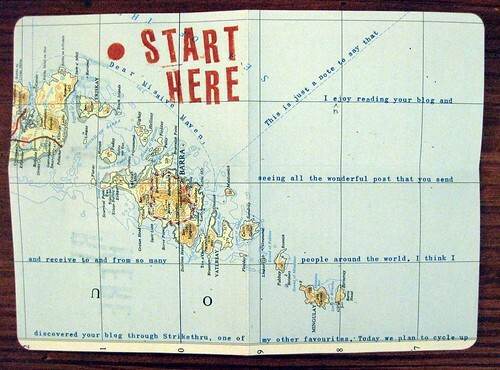 The letter itself was creatively typed on an old map, and included the grooviest polaroid photo. Start here. HOW did he type on a curve and a diagonal like that? I don't know typewriters very well though I do appreciate their anachronistic charm, so this is quite a mystery. (I will insert an aside and say that I am generally not fond of computer-typed letters - I'd rather decipher even the most difficult handwriting, because there is such personality in handwriting - but somehow a typewriter is just different, and every bit as charming as handwriting.) And the typewriter ribbon/ink/what have you is BLOO. Another swoon! I left the typing intact here because I don't think they'll mind (this letter was signed from two people, though only one really did the typing), and it's just so cool. So here is where he explained how they took a photo of the letter. The letter was typed and explained the plan before it was executed - I LOVE this planning! 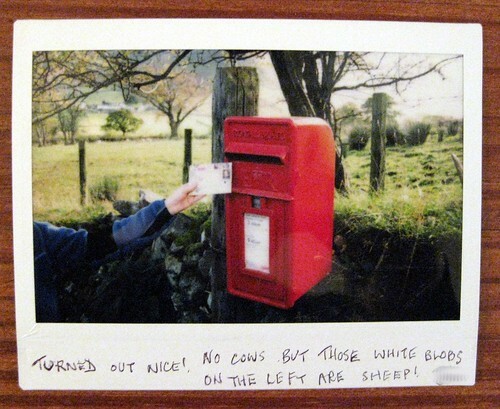 They went on a bike trip in the countryside, found a fantastic old post box, took a polaroid of the letter about to go into said mailbox, put the polaroid in the letter and mailed it. So I get to see exactly where the letter was mailed! I am kvelling, yes, but I am really delighted by this concept. 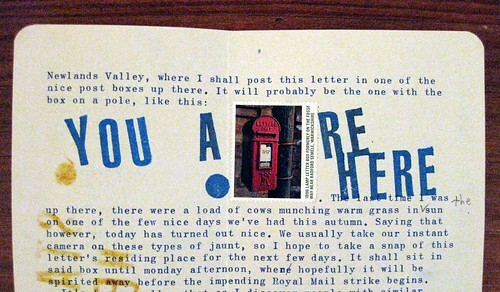 What a fantastic idea, and it's not just all concept - the typed letter was witty, charming, and delicious, and I have a fantastic new correspondent in the UK now. Oh. My. Gaaaaahhh. I am literally in a 'shock and awe' moment. This thing is beautiful, stunning and just, wow. haha I am also a mail geek, so like, this must be what it's like when other girls see Johnny Depp on a red carpet. Like..I am in love with these people! Too, too cool. Do they have a blog of their own? If they don't, they must, cause I'd visit daily to see this kind of amazing. wow, what an art piece! i love the creativity out there! 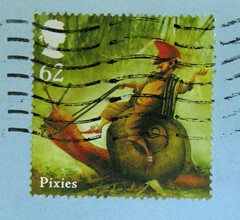 Hey Lauren - I just added a closer view of those stamps. They're pretty cool, huh? I like your letter photos - let me know the new mail blog address!! Aww, thanks. I should be able to have it finished within the next week/week and a half. I'm still deciding on a name though, haha. what a fabulous letter and all the history on it . I love it and yes I am a mail geek . Wow! 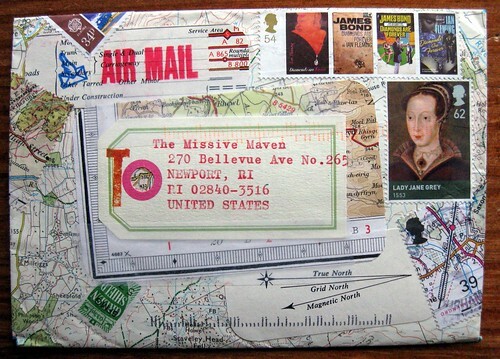 That letter is so cool, from the typewriter use to the stamps to the vintage map (I love wrapping presents in maps but never used one for an envelope before). I LOVE James Bond! I am very addicted to handmade envelopes, I love the rubber stamps, they give the perfect touch and what I can tell about stamps? 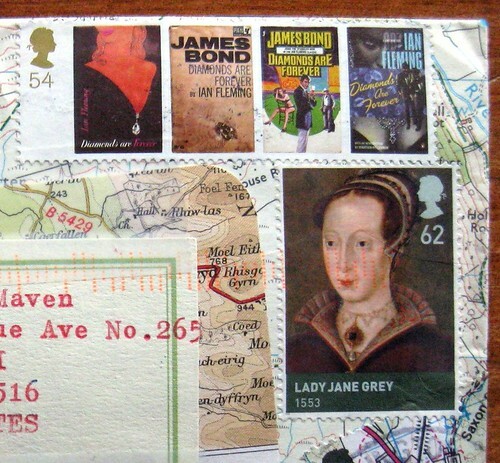 Who can tell that traditional mail isn't great, the worker in the post-office freak me out all the time I go there, because he doesn't want to give me postage stamps because it takes some of his time to choose them, but I fight and get them. As Lauren S., I would also be very interested in seeing their blog! Absolutely the best letter/envelope I've seen in some time. Their blog is The Atrocious Snowman. It's not a mail blog, but has some interesting mail bits... I didn't see any personal info on there so I hope they don't mind me sharing that info! really great! I am was just playing around with some material like this yesterday. I love love love love love love love love love love love love love love love lvoe love love this! So cool. 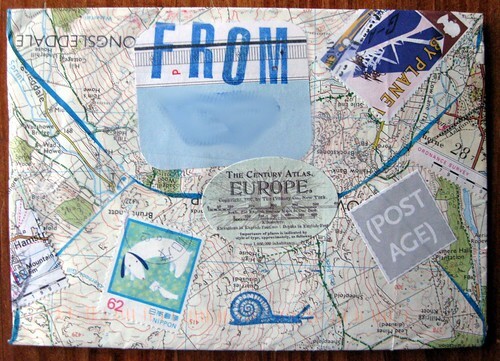 I once sent out a few map envelopes, but never heard back from the people I sent them to, so I considered them a flop. This one is beautiful. And the fabulous stamps. What a fun, wonderful package. I just stumbled upon this site while searching for something completely unrelated. Neat site! 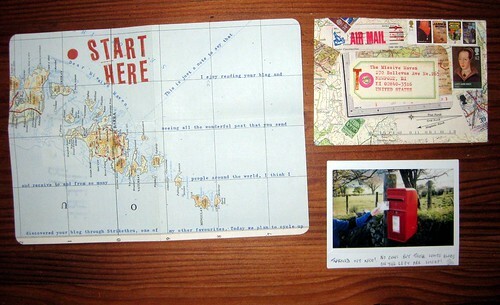 The crazy map envelope and contents are amaaazing! Definitely inspired to create some cool stuff to send to friends.